Rev. M. Catherine Volland grew up in New York State and moved to Colorado in the late 1970s. She earned a B.S. Ed. from the State University College of New York, Buffalo, and an M.A. in Education (Instructional Technology) from the University of Colorado Boulder. Rev. Catherine taught in the public schools for many years, and then worked in the computer software industry, as a writer, trainer, manager, and senior executive, in the United States and Europe. For five years, Rev. Catherine was a professor at the University of Colorado Denver in the MBA program, teaching Managerial Communications and related courses. She then returned to the high-tech business for a few years before earning an M.Div. degree from the Iliff School of Theology in Denver. Rev. Catherine was ordained a priest in January 2009 and came to St. Bede's in 2014. She is delighted to share a blessed, committed, and grace-filled marriage with Margaret Thompson, a spiritual director and life coach. They are both delighted to be living in Santa Fe. Jenny moved to Santa Fe in 1974 from Kansas City, Missouri to undertake a three-year glassblowing apprenticeship. After the apprenticeship, she built and operated a glassblowing studio in La Cienega, NM. She received a BFA from the University of New Mexico with an emphasis in sculpture and drawing. Jenny gained her business and professional skills through her involvement in the arts, Santa Fe Greenhouses, and as manager of The Monks’ Corner, in Santa Fe (a retail store owned by the Benedictine monks of the Monastery of Christ in the Desert). She then became the Agricultural Manager of the monastery where she helped establish a hopyard for varieties of hops native to northern New Mexico. This allowed her to live in the majestic Chama River Canyon Wilderness for over four years. After completion of this project, Jenny came to work at St. Bede’s in the summer of 2013. Deacon Jeff moved to Santa Fe in 1994 from Ann Arbor, Michigan. He was employed at Los Alamos National Laboratory in Human Resources for several years. Currently his day job is working as a Bureau Chief for the New Mexico Children Youth and Families Juvenile Justice Services Department where he directs the strategic planning on programs to assist delinquent juveniles in New Mexico. Deacon Jeff was ordained as a vocational deacon in the Roman Catholic Church in 2003 and moved to the Episcopal Faith in 2009. He was received as a transitional deacon in the Episcopal Diocese of the Rio Grande June 2017. His church ministry and community work surrounds volunteering with the Interfaith Homeless Shelter, HIV awareness group, mentoring in the Sewanee Education for Ministry Program, singing in the choir, and serving on the local branch of the NAACP. He has earned a MBA from the University Of New Mexico and a Doctorate in Organizational Psychology and Interdisciplinary Leadership from Creighton University. Deacon Jeff’s dissertation was on "Framing Thoughtful Leadership Intervention in Academic Workplace Bullying: A Collective Case Study". Deacon Jeff is studying in the Iona School and takes online MDiv courses at Iliff Theological Seminary and Chicago Theological Seminary and hopes to be ordained to the priesthood in June of 2019. 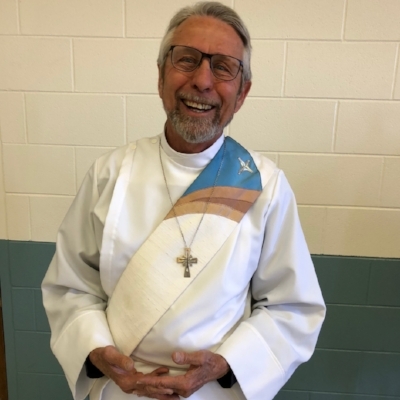 Deacon Owen has been a resident of Santa Fe for 46 years, and Chaplain and Grief Counselor for The Hospice Center of Presbyterian Medical Services for 35 years. He has served as Deacon at St. Bede's for 33 years. Deacon Owen received his BA from St. John's College, Annapolis, Md. and an MA from Harvard Divinity School and Emory University, Atlanta, Ga. He is an LPN, NNMCC and did his Clinical Pastoral Education at St. Joseph's Hospital, Albuquerque, NM. He is delighted to be married, to Gail and they enjoy their five children, eight grandchildren, and four great-grandchildren. Jerry’s lifelong love of music began by first singing in his church’s youth choir, where he was encouraged to begin learning to play the organ when he was twelve. Jerry’s involvement in church music ministry continued throughout his school years. Having served churches in both his native state of Wisconsin and in Arizona, Jerry spent 17 years at St. Bede’s Episcopal Church in many roles including choir member, organist, and choir director as well as Vestry member. In 2000 he was invited by then Music Director Gerald Near, to be one of Church of the Holy Faith’s section leaders and then Music Director in 2006. Jerry was pleased to return to St. Bede’s as its Music Director in October 2009 and is currently responsible for playing the organ, piano and preparing the Parish Choir for its ministry. He was inspired to work in the field by his long friendship with Lawrence Bandfield, founder of the Santa Fe Desert Chorale and choir director at St. Bede’s for many years. Jerry’s love of music is not limited to church music and has performed with many other organizations as soloist, chorister, conductor, and accompanist. While his ministry at St. Bede’s is only part time, he also works as a non-profit management consultant, and is President of the Sangre de Cristo Chorale, a community chorus. St. Bede's is blessed to have among us several Assisting Priests and Canons, who retired here or are bi-vocational. We are grateful for their teaching, preaching, pastoral care, and the wisdom and experience they share with the other clergy staff.